In place for for our little trip with the grandchildren. Moved to the visitor moorings at Kintbury where there is good parking, usually, but today there is a CRT work party around and of course all have come by car so no room at the inn, but that TDL found parking near to Vicarage Bridge. 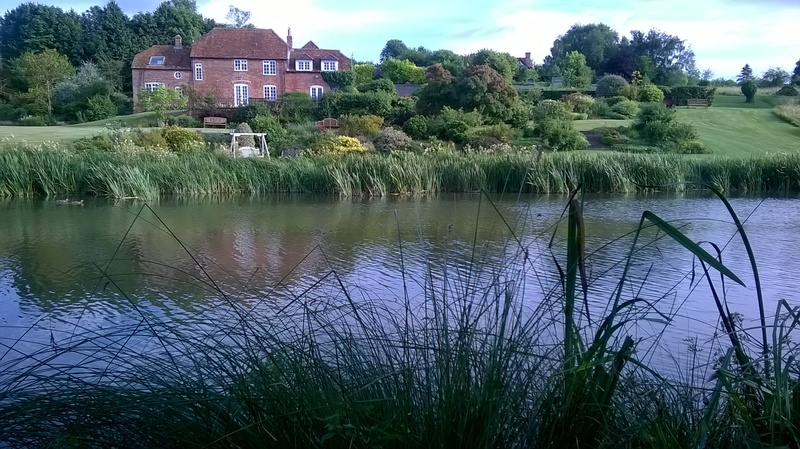 The vicarage and a story about Jane Austin. At least we were able to unload the copious stores, provided by Margaret, and very welcome on board they were too with so many hungry mouths to feed. I think the logistics of the trip worked quite well. 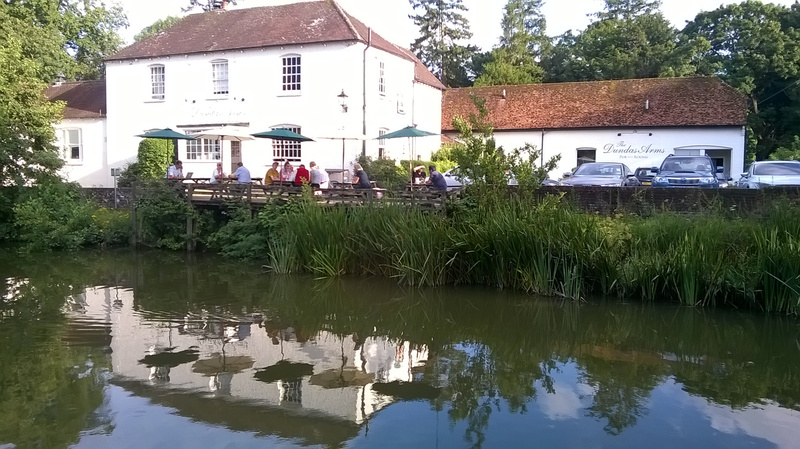 We met at the fisherperson's carpark by Church Bridge at Great Bedwyn [Bedwyn Mawr! ], abandoned my car and drove to the boat at Kintbury visitor moorings. Unloaded supplies and then moved on to just beyond Hungerford Marsh lock. 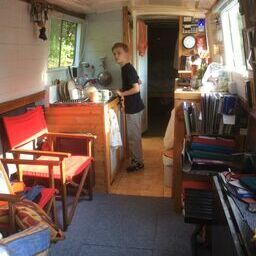 Soon on the move and Oscar takes the helm. Eve takes to the gunwale walk, with alacrity and panache. See what I mean, this one is for YOU mummy! Now we have a bridge to open. Moored just past Hungerford Marsh Lock. 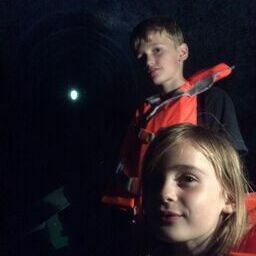 Next day got us back to Great Bedwyn by boat and then by car for our evening meal in the Blue Ball at Kintbury, the kids assembling their own pizzas. [Have you washed your hands? says Stuart]. Car shuffle gets the Lynche's car to Sam Farmer Lock and mine back to Great Bedwyn. The kids discover magnet fishing. Back to the Blue Ball for hand forged pizzas. 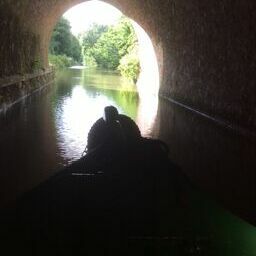 A good day's boating took us up the rest of the locks to the top pound and then on through the Bruce Tunnel and back to moor by Crofton top lock for the night. Cj clears a spot for our tent at Crofton top lock. Could that be back to magnet fishing? Our last [half] day dropped us back to Crofton bottom lock, stopping by Sam Farmer lock on the way down to offload the crew's belongings. Margaret serves up morning croissants. Somewhere along the way, Cj introduced the kids to the idea of 'stepping through a broom', a deceptively simple bit of gymnastics that is easy for the young but gets more and more difficult as one groes older. Women are much better at this than men too. They demonstarte the technique perfectly. By then, TDL had moved their car down to the Crofton pumping station carpark and the company departed despite an attack by a beligerant swan in the Crofton bottom pound as they tried to depart. Returning to Cribbit, Cj espies a guy in a dayglo jacket, who he thinks just might be a CRT volunteer to whom he can complain about the rougue swan. As it turns out it is Paul, from Ohio, and he is inveigled to help move down to Church Bridge. We pick up his wife on the way, and despite my offers of a lift back in my car, they opted for the vicarage high tea at Great Bedwyn church and a walk back in the rain.